BEAK FUTURE: A crimson rosella. For now, at least. Climate change could alter the colour of local rosellas, according to Geelong scientists. Their findings suggest the parrots could fade from deep crimson red to the pale yellow of rosellas endemic to drier parts of Victoria. Deakin University called the research an “important test” of Gloger’s Rule that birds were usually darker in areas of higher humidity. But the reasons why were unclear because previous studies were restricted to investigating single possible factors in isolation, said study co-author Dr Mathew Berg. “It’s only now thanks to the rapid advances in technology that we’re able to look at really big sets of climate data, access satellite measurements of vegetation coloration over large areas, and conduct advanced analyses to look at all the possible factors in combination,” Dr Berg said. “When we crunched the numbers we found the rosellas’ colours seemed to be closely related to the colour of the vegetation of their habitat, links which may arise to help them be more camouflaged from predators or conversely to stand out to other members of the species. “We used data gathered by satellites to measure the habitat coloration across eastern Australia, and found that this was a good indication of the colour differences of leaves in the habitats, and also the best predictor of where to find the crimson birds. The Deakin team now wanted to find out how climate change might affect the dispersal of rosella colours, Dr Berg said. 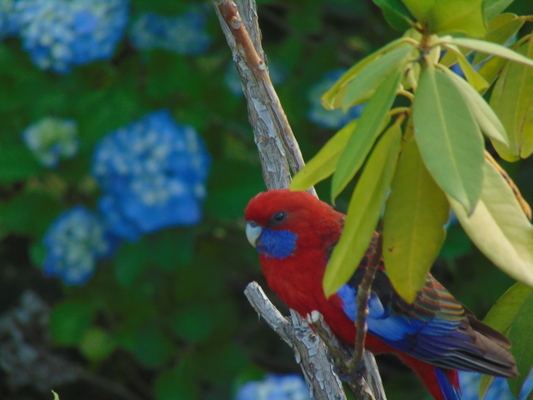 The rosella findings could have “important implications” for parrot conservation, Dr Berg said. “Work like this increases our understanding of the habitat requirements of parrots; why they can live in some areas and not others.